Northville Village Hall is located at 412 South Main Street, Northville, NY 12134; phone: 518-863-4211. Photo: Home at 201 Bridge Street, ca. 1890, Northville Historic District, Northville, NY. The Historic District was listed on the National Register of Historic Places in 2014. Photograph by Jennifer Betsworth, 2013, New York State Historic Preservation Office, for nomination document, Northville Historic District, Fulton County, MA, NR# 14000191, National Park Service, National Register of Historic Places, accessed September, 2014. Samuel Olmsted and Zadoc Sherwood, the first settlers of Northville, paddled up the Sacandaga River in 1788. Attracted by the valley and Hunters Creek to the west of the river, they built log cabins near the ford and established a small settlement northwest of Fish House. Over the next decade, a small number of families joined them in the valley. Most built modest homesteads and engaged in subsistence farming. They focused on growing hardy cereal crops, like rye, barley, and wheat. However, the soil was poor. Within two decades, the soil was too depleted to continue growing good wheat. In 1790, Thomas Foster built a gristmill on Hunters Creek; he later built a companion sawmill. To encourage further settlement and ease travel within the town, Broadalbin appointed commissioners of highways to lay out new roads. They established a road east of Northville in 1794 and laid out its Main Street in 1797. The new roads, and the resulting increase in travel through the area, spurred the growth of the village. Due to the increased settlement, the town of Northampton was created from Broadalbin in 1799. Abram Van Arnam opened the first store on Main Street in 1800; over the next decade, he continued to expand his store complex until it included a tavern, clothier, shoe store, and tannery. The first village school was opened the same year. Joseph Spier opened another store on Main Street soon afterward. 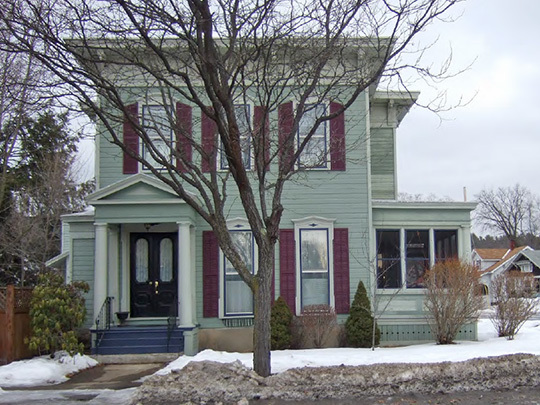 Caleb Meeker, the first blacksmith in the village, established himself on the north end of Main Street, and Dr. Mitchell, who was the village's only resident physician for decades, had his home and office at the south end. Though Northville was beginning to establish itself as a center of commerce, it was slow to grow; only seven families lived on Main Street in 1807. Joseph Spier built the first brick building in the village, a two-story Federal-style home (331 South Main Street), in 1819. Jennifer Bettwworth and Travis Bowman, New York State Historic Preservation Office, Northville Historic District, Fulton County, NY, nomination document, 2014, National Park Service, National Register of Historic Places, Washington, D.C.